Nassau is the caipital, lairgest ceety, an commercial centre o the Bahamas. The ceety haes a population o 248,948 (2010 census), 70 percent o the entire population o the Bahamas (353,658). 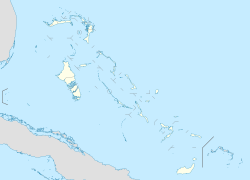 Lynden Pindling Internaitional Airport, the major airport for the Bahamas, is locatit aboot 16 kilometres (9.9 mi) wast o Nassau ceety centre, an haes daily flichts tae major ceeties in the Unitit Kinrick, Unitit States, Canadae an the Caribbean. The ceety is locatit on the island o New Providence, that functions much like a business destrict. Nassau hooses the Hoose o Assembly an various judicial depairtments. Nassau is considered a historical stranghauld o pirates. Wikimedia Commons haes media relatit tae Nassau, Bahamas.